Great read as far as theory is concerned. As usual HC VERMA is a book in its own unique way. Also MCQs, short type questions, numericals, summary and all that which makes it a MUST READ. 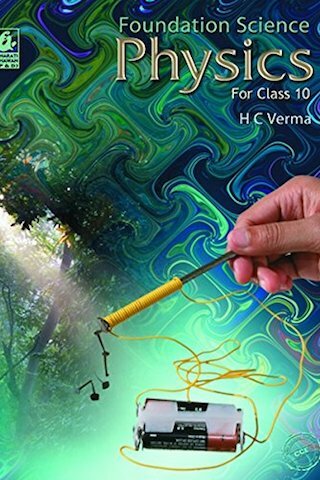 Best book as concepts explanation is excellent and practice questions are also of best standard required for class 10. The goal is to provide students with a strong foundation in science. Common, everyday experiences are widely used to illustrate scientific principles. This should make the reading interesting as well as help students realize the intimate relationship between science and nature. When a new equation is derived or a new concept is introduced, generally, a numerical example follows. These in-text numerical examples should help in clarifying the exact meaning of the terms in the equation and in the elaboration of the concept. The main points discussed in a chapter are collected at one place under the heading Points to Remember. This should help students in quickly revising the chapter, but I strongly discourage depending too heavily on this section. In each chapter a separate section on solved problems illustrates how the equations and laws discussed in that chapter can be used in working out problems. The exercises are not only to test the understanding of the students, but also to make it better. A carefully formulated exercise problem encorages the students to think deeply about the principles involved and in the process makes his understanding of the concept clear. I have tried my best to formulate exercise sets to stimulate the minds of the students. A special section called Postscript is given at the end of some chapters. In this section, I have given some interesting facts related to the subject of that chapter. In some cases simple activities or projects are suggested. These activities can be performed without any special equipments. I hope students will enjoy this section. The book is easily available on book shops. You can also buy it from Amazon and Flipkart. Buy now at Amazon.